Day 3. This week is flying by. I guess it's true what they say about time flying when you're having fun. And, Just in case you're tuning in late, you can see the other projects I've done to celebrate my birthday week-Day 1, Shag Pillow and Day 2, Polkadot Birthday Banner. For today's project, Gwen and I actually did the same thing. I have been wanting to make a pincushion for a LONG time. I mean, it seemed kind of silly that someone who sews as much as I do, didn't have a pincushion. I mentioned this to Gwen and she sent me a link to this pincushion. I was sold! The tutorial is easy to follow and I love that the pouch holds all my scraps. That is probably my favorite part of the whole thing! I have loved my new pincushion. It's bright and colorful and works wonderfully for me. Are you ready to see Gwen's? Holy Stinking Cute, Batman!! I LOVE the rainbow top! To get the details, head over to her blog. I just want to say a quick thank you to everyone for all the birthday wishes. I really appreciate all the love and support I get from my readers and friends who comment and take the time to visit. I hope you'll come again tomorrow for the last project, and for sure come on Friday for your chance to win the GIVEAWAY!!! 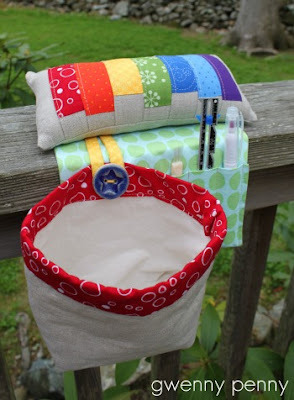 This tutorial has to be one of the best pin cushions ever. It's so much nicer to use than my little tomato pin cushion I had before. I LOVE the fabric you used, especially the print on the pocket. So cute and practical -- just love it! K, both of these are so stinkin cute! I love how colorful both of them are, and the little pouch, that is a great idea! So cute! I love the bright and cheery colors and patterns. It's so you! Hope you are having one of the best birthday months! I am a new follower! Super cute and such fun colors! Amy & Gwen, I LOVE THIS! I just printed the pattern off and I am going to make this! I will show it off when done! Hope you two are having a great bday week! Wow you and Gwen did awesome jobs!! I love both of your fabric choices! Gonna make one of my own very soon! Too stinking cute! I love the fabric selection. I have a version of that from 1980-something...totally not as chic or cute...If I find it I will post a photo so you can laugh - I am sure it is peach or forest green...and I was like 8 when I started using it. I definitley need an updated version - WAY CUTE! I love this! It is so bright and happy and will make your late night sewing a little nicer:) Great job Amy! This is great. Thanks for posting the tute. Stopping by from Whipperberry. May Point of View Reveal- Pillows! The Big Birthday Bash Giveaway Post!